LPC2E originated in the Groupe de Recherche Ionosphérique (GRI) located in Saint-Maur-des-Fossés (94) and Issy-les-Moulineaux (92). This GRI, formed in the early 1960s, developed the first French satellite, FR1. 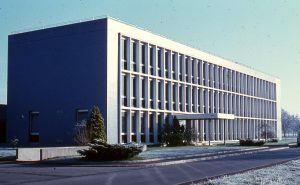 Over the course of successive developments, part of the GRI moved to the new CNRS campus in Orléans-La Source in 1972, giving rise to the Centre de Recherches en Physique de l’Environnement terrestre et planétaire (CRPE), located both in Orléans and in the Paris region. In 1982, the Orléans component of the CRPE became autonomous by becoming the Laboratoire de Physique et Chimie de l’Environnement (LPCE), the CNRS’s own research unit (UPR). In addition to the initial group, which specializes in space plasmas, local teams specializing in atmospheric physico-chemistry and planetology were added, and in 1998 the laboratory became a Joint Research Unit (UMR) associating the University of Orléans with the CNRS. The other part of the initial GRI has been grouped together in the Centre d’étude des Environnements Terrestre et Planétaires (CETP), whose teams participated in 2009 in the creation of LATMOS and LPP, laboratories related to ours. Since the end of the 1990s, the LPCE has created an astrophysics team, thus giving in the region a scientific partner at the Observatoire de Paris, which supervises the Nançay radio astronomy station. Throughout this evolution, the laboratory has firmly maintained itself as one of the “space laboratories” of the CNRS Institute of Sciences of the Universe (INSU), which motivates the second E (as Space) added to its name in 2008 to emphasize this identity. Finally, in 2010, LPC2E was one of the founding laboratories of the Observatoire des Sciences de l’Univers en région Centre (OSUC) with the Institut des Sciences de la Terre d’Orléans (ISTO) and the Station de Radioastronomie de Nançay, and associated teams from other laboratories.